Holes in Maps: A Public Program Presented with 601Artspace. Holes in Maps. Presented with 601Artspace. Please join No Longer Empty, in collaboration with 601Artspace, for a public program revolving around questions many of us are asking: how can we, as curators, artists and art workers meaningfully address and counter current immigration policies and support the vulnerable communities we work with? The program is presented in relation to Holes in Maps, the current exhibition at 601Artspace. Curated by Juliana Steiner, the exhibition features the work of artists who challenge the certainty and stability of maps and boundaries, exploring the immense gulf between lines on paper and lived experience. In addition to the global migrant crisis and systemic inequality, the exhibition speaks to the rise of nationalist, populist rhetoric, through artworks that expose the fault lines within symbols of national identity. The evening will begin with a conversation with exhibiting artist Juan Obando about his practice’s focus on the intervention of systems defined by accelerated globalization and accumulated capital, followed by a presentation by Reverend Juan Carlos Ruiz about the history of sanctuary spaces and featuring the work of documentary photographer, Cinthya Santos-Briones. We will conclude with a Know Your Rights training by Luba Cortés that offers practical information about legal rights and how to react effectively when interacting with ICE. A Q&A and open dialogue will follow. The program will be moderated by exhibition curator Juliana Steiner and No Longer Empty curator, Rachel Gugelberger. Luba Cortés is Immigrant Defense Coordinator at Make the Road New York, a writer, organizer, and advocate, whose work explores the intersections of undocumented experiences, queerness, and indigeneity. They came to New York from Puebla, Mexico, and has been organizing immigrant communities since they were a teen. Luba’s current work is focused on supporting detained immigrants and changing the narrative around enforcement. Juan Obando is a Colombian artist who lives and works between Bogotá and Boston, where he is an Assistant Professor in the Studio for Interrelated Media program at the Massachusetts College of Art and Design. Throughout Obando’s work, the world appears as a network of operating systems defined by accelerated globalization and accumulated capital. His work focuses on the intervention of these systems towards the production of site-specific video-performances, post-digital objects, and screen-based installations —using social phenomena as raw material and humor as a catalyst in the revelation of systemic ironies and contradictions. Rev. Juan Carlos Ruiz is co-founder of the National New Sanctuary and has served as an organizer for the New Sanctuary Coalition to expand their Legal Orientation Clinics, Accompaniment Sanctuary Program and Sanctuary Hood. 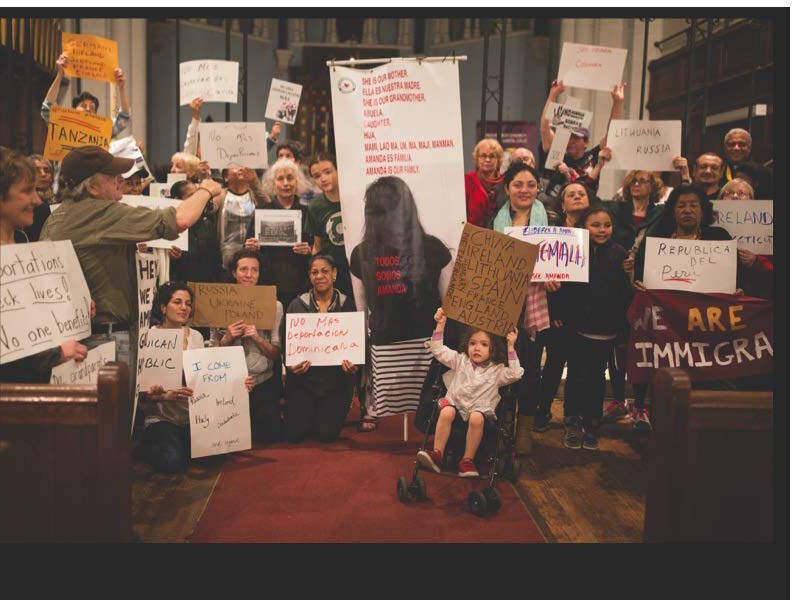 He lived in St. Jacobi Church in Sunset Park, Brooklyn, where he and documentary photographer Cinthya Santos-Briones coordinated the church’s sanctuary space. Influenced by the struggle for human rights, issues of migration, gender, and identity, Santos-Briones’ photography grew out of her work as an anthropologist in Mexico and a community organizer in New York. 601Artspace partners with artists, curators and other not-for-profit organizations to produce unconventional exhibitions, talks, film screenings and special projects within a non-commercial context. Often its permanent collection acts as a catalyst for artistic and curatorial encounters. Through such interdisciplinary practices, 601Artspace engages with and investigates issues in the production, organization and reception of contemporary art. Image: Cinthya Santos-Briones, from the series Living in Sanctuary. Courtesy of the artist.